This is such a decadent brownie. Rich with a favorite cookie inside them and are tops in our household. The cookie inside is what makes these brownies over the top! Bursting with chocolate and peanut butter is the perfect combination and makes them a wow factor. The chocolate frosting just puts them over the top indulgent! Anytime I make brownies I need to step it up with a little gourmet surprise inside. Who doesn't love their favorite childhood cookie hidden in rich chocolaty brownies? 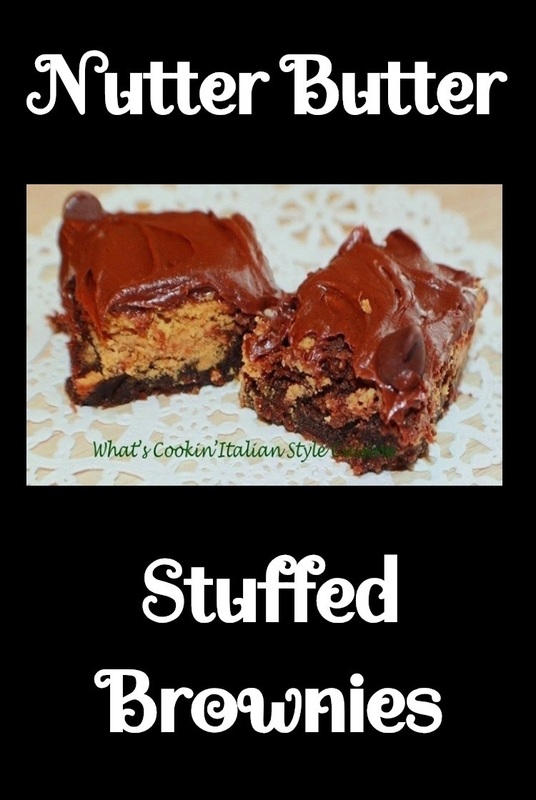 Well come on and read this little section and make your favorite stuffed brownies and use whatever cookies you like. Today its nutter butter stuffed brownies and the kids went nutter butter over them. My bunch loves chocolate, that's why I frost them. If you don't want the sugary sweet frosting on top, try adding some chocolate chips on top while still warm. They will soften easily and then you can just spread them over the warm brownies. I then refrigerate them before cutting them also. I like to think of these brownies as decadent semi homemade chocolate treasures. I have made them stuffed with everyone favorite cookies from chocolate filled cookies to peanut butter. It doesn't matter what you stuff the batter with as long as it's your family and friends favorite. When I bring these to work everyone would go nuts over them. 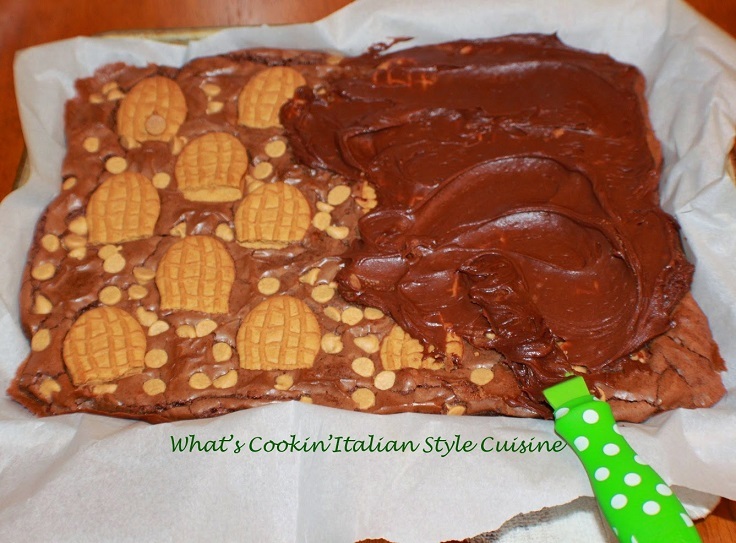 There have been many times we have a potluck get together at work and this is the quickest throw together dessert that is loved by all! These easy nutter butter stuffed brownies don't require a lot of work or time. When I get home after a long days work, I always have time to make these to bring to work the next day without getting tired out. Great Baking Idea For the Kids! The kids love making these with me. Sometimes we spread each cookie with peanut butter before laying them down in the brownie batter, if you have extreme peanut butter lovers, try it. The peanut butter oozes out of the batter and really is delicious. I just have to warn you though, it's peanut butter over load. For years I tried to cut them and brownies always stick to the knife! This is a little tip that works and I have been using for years not to make perfect non stick cuts! A simple plastic knife will cut the brownies perfectly. I don't know what this works but it does! 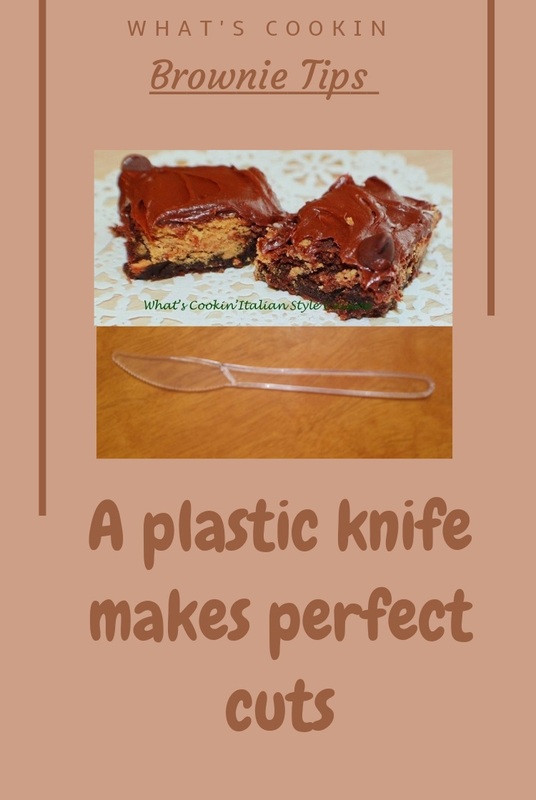 So be sure to keep some plastic knives in the drawer to cut your brownies easily! A quick semi homemade brownie using a mix and stuffed with a delicious store bought cookie everyone loves called nutter butters. Mix the brownie to instructions and prepare the brownie sized pan lined with parchment paper. Pour into your prepared pan. Place broken halved nutter butter cookies evenly over the batter and press into the brownie mixture. Sprinkle evenly with peanut butter chips. Bake at 350 degrees until the middle is set and come clean using a toothpick about 35 minutes. Cool completely and frost with chocolate frosting. Optional: sprinkle top with chocolate chips. Oh, boy, these brownies are a peanut butter lover's dream! My two oldest children would love these!